Kiwalie (our Guild leader) visited several Guild Islands , and let us choose among her favorites. Previously, I didn't notice these buildings. on the Guild desktop (OCC: an Island tab in the Guild window), with a message indicating that our head had not yet chosen an island. The comments could not always be hidden (I tried to hide the names). We arrive then on a whole new region (some are very quirky). OOC: The Island window changes, a new toolbar is active. 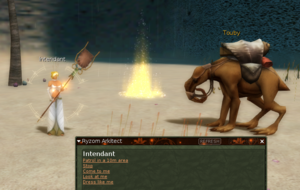 For the moment, we can spawn a mektoub and an Intendant. Some commands are available. You can see here the entry, which is also a rez point. in the toolbar of the Island window (OOC: using G, which opens / closes the Guild window, the part in blue white yellow and red) once you are on a Guild Island. In red, Leave the guild Island, and the SE button is on its left. the 3 icons at the top right: adding a group (of objects), hide / mask the collisions, reset (delete all your objects and groups). Now, let's see below the two windows, with some tests: the Batiments has 17 objects, Divers 1, each group is on its line and has 3 buttons: Hide Edit Remove. the line is transformed (edit remove are hidden, an icon appears, next to HIDE) and it's this little yellow icon that opens the beautiful (new) object selection window - with hover preview - named SE Shape List (see the picture above, showing the 2 windows). We will add trees here (on the left, choose Plants). 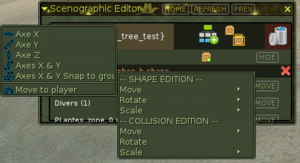 Go to the desired place, choose a tree (the window SE Shape List is automatically reduced), don't clic yet... Then, make 2 clicks to add two trees, and then right click to exit. The red cross, on the right, will erase those in excess. Save. on the list (more practical when there's 2 or 3 very close). Then, choose Move to player in menu Shape Edition / Move. To reduce the size, without deforming: Save (as soon as you let go, it applies), then Shape Edition / Scale / Axis X & Y Z : see how it turns when moving the hand, left click to exit. Shape Edition / Rotate / Scale / Z is very handy and useful. You can not create a group in a group. When you edit a group, the others are hidden. 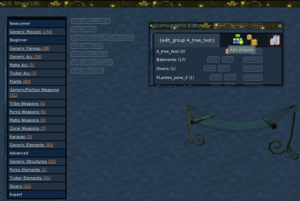 Groups can not be used to move a group of objects. We can not rename them (annoying). To Pocket Worlds (from 2018 July), present ARK and Ring. It was a technology, type Karavan, that I never knew  since disappeared for ages. OCC: There are traces here and elsewhere. This page was last edited on 8 March 2019, at 17:32.